We take pride in our cheese, and as such hold ourselves to the highest standards. Our products are sustainably made on the farm without the use of toxic pesticides, synthetic hormones, antibiotics or GMOs. Glorianna: A blend of raw cow and goat milk. This cheese is very similar to a Caerphilly, and is bestutilized Within 6 months for a creamy texture. Named after the Cheese maker Gloria. GregGarian: A washed curd cheese, similar to Gouda. This cheese is made with our raw cow milk, and produces a mild and creamy cheese from 2 – 6 months. Then it picks up a very sharp taste. Jack & Willy: Our version of a Pepper Jack. An all cows milk cheese with a mildly spicy essence and a whirlwind of flavor and creaminess. 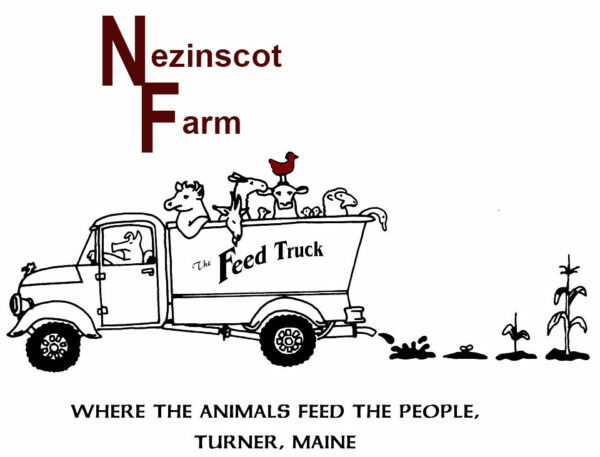 Nezinscot: Made with raw, whole cows milk with additional cream added. Similar to a Double Gloucester, this cheese is creamy and sharp both at a young and old age. Named after our farm. Boursin: Our plain La-Vache blended with chives, pepper, garlic, salt and parsley. Feta: Goat’s milk in season and Cows milk the remainder of the year. Creme Fraiche: A traditional English breakfast sweet cheese spread. Want to learn more about our cheese making process? Sample? Demo? Or make your own? Visit our events page and learn about our upcoming workshops or Open Creamery Day!